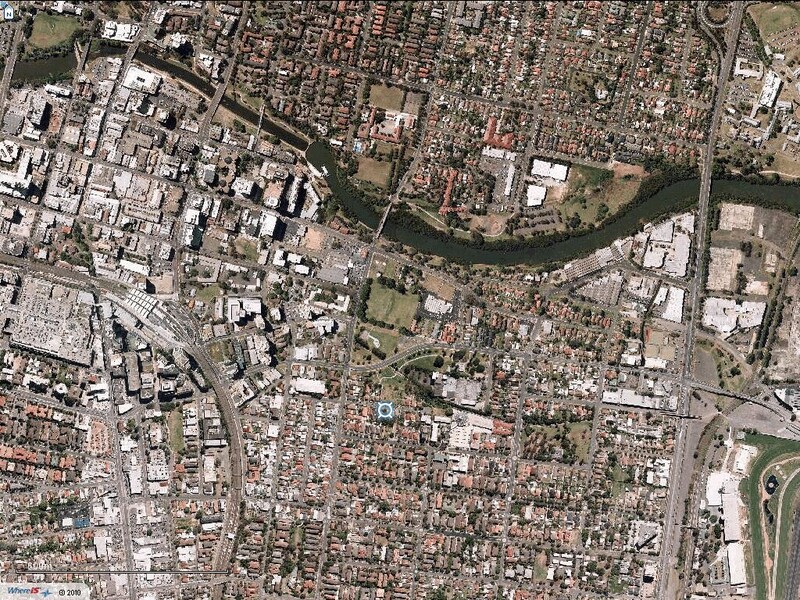 Governor Arthur Phillip knew from scouts he had sent out that further up stream near the limits of navigation on the Parramatta River the vegetation suggested better soil. On Sunday 2 November, 1788 he established a small outpost at Rose Hill on the south bank of the river, with 100 convicts and 20 marines. Among the convicts was James Ruse, though he claimed to the Governor that his sentence had expired in that August. The records brought from Britain were limited and he was still counted as a convicted man. With the colony needing food, some government farms were set up using convict labour, but they showed little enthusiasm in the heat, however by July huts had been built and there was hope, if little prospects for food production. Governor Phillip perhaps saw something in this Cornishman working among them, who had proven strong and reliable, with a farmer’s background. Perhaps Phillip was ready to try new ways of dealing with the prospects of his settlement. Whatever the reasons he boldly set him up on a 1½ acres cleared next to Clay Cliff Creek, with provisions, seed grain of wheat, barley, oats and corn, tools, and had a rough hut built. Perhaps also the brief arrival back in the colony from Norfolk Island of fellow Cornishman Lieutenant King, whose advice he often listened to, was a factor. We will never know. 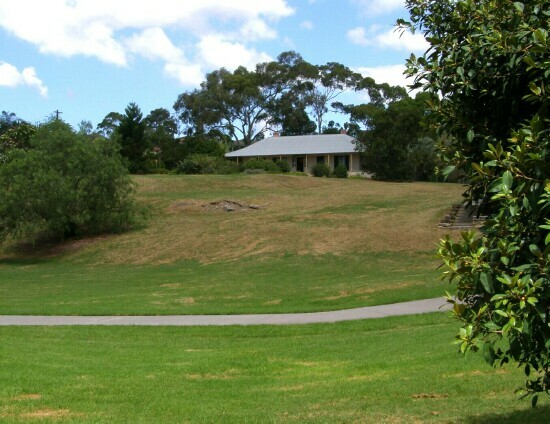 Ruse prepared the land for planting, and seeing the soil better than at the Sydney settlement but still poor, he made up compost to use in lieu of manure which was not available due to so few farm animals in the colony. 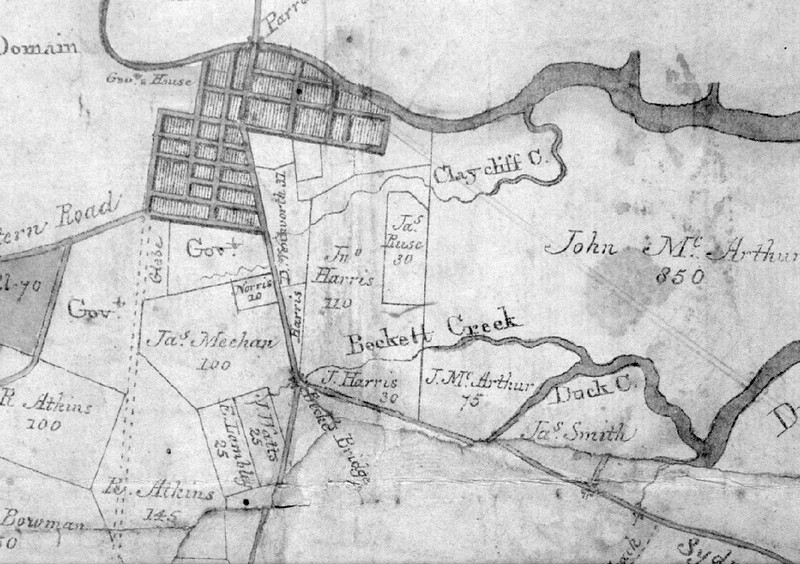 When the output of the government farms came in during December 1789 Sydney had produced 25 bushels of barley, Rose Hill had produced 200 of wheat, 35 of barley, and small amounts of oats and corn, most of which was put aside for seed grain. It was clear than Rose Hill was the hope of saving the colony from looming starvation, and Ruse’s success or otherwise would be crucial. By November 1790 Ruse’s industry was showing through, and for our purposes – ingenuity. As well as compost, he had burnt the cleared timber and dug it into the soil, hoed it, and made what seems to be and Ard or scratch plough (in the absence of a suitable clod plough capable of handling the conditions), again turning over the soil as best he could. Phillip allowed him use of further land, and by March 1791 Ruse ceased all claim to the government stores for food, as he was now self-sufficient for his wife and himself. Governor Phillip granting him 30 acres and having a stone house built for him, calling the farm, Experiment Farm. This was the first grant of land made in the colony. Wife? – you ask. Yes, it is a good thing that official papers from home were lacking, because landing from the Lady Juliana in the Second Fleet on 3 June, 1790 was 19 year old Elizabeth Perry from Middlesex serving a 7 year sentence for stealing 39s worth of clothing. She appears to have been sent to Rose Hill to work, where she met our James Ruse, by now 29, technically a free man, and by now with land. They were married on Sunday 5 September, 1790 by the Rev. Richard Johnson. Rev. Johnson was of course unaware of any previous marriage, and James would not know whether his wife was alive or dead, being on the other side of the world – but certainly ‘lost’ to him. James at least could sign his own name, the clergyman signed for Elizabeth. Importantly Watkin Tench’s report on his visit to the Ruse’s shortly after suggests that his first proper harvest yielded around 13 bushels of wheat and more of maize, plus a kitchen garden, just from his own 2 acres under cultivation, and despite theft, drought, birds and insects. By December 1791, with a growing family, the Ruse’s had over 11 acres under crops, mainly maize plus pigs and chickens. Within a few years other settlers taking Ruse’s lead were being successful, on top of what the government farms could produce, and new more fertile land was being opened up. What then for Elizabeth and James Ruse? Whatever one may wonder of Elizabeth’s original motivations, she was a solid worker and companion throughout their later lives. On the 16th July, 1792 she was emancipated, the first females convict to be granted this by the Governor. She stood by James as he first sold the Rose Hill property in late 1793 to doctor and businessman John Harris (who built a new house, standing today) for ₤40, which was soon spent. Then he was granted land on the newly opening Hawkesbury River flood plains where he was again successful at farming until major floods wiped out the farms a few years later. After that James never seemed to settle for long, for over the next 30 years he or his wife were granted or purchased 11 parcels of land, and cleared 400 acres. At times Elizabeth, with her large family, ran the farms and he was off as a hand on the newly introduced coastal ships. Later James was also made a ‘constable’ for a while. When their farming fortunes waned, finally he was hired as an overseer on a property near Campbelltown. In 1836 Elizabeth died, aged 65, and James followed 18 months later on 5 September, 1837 aged 77. 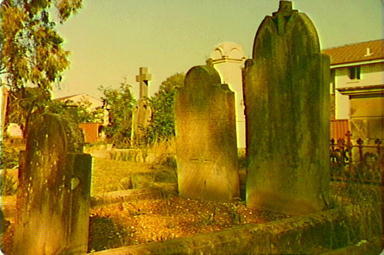 He was buried at St Johns Catholic Cemetery in Campbelltown. who departed this life September 5 in the year of Houre Lord 1837. Natef of Cornwell and arived in this coleny by the Forst Fleet. Aged 77. Ruse hadn’t fed the colony all by himself, for his material contribution was small. What Ruse had done was show the way for the future of the colony’s agriculture, that is was possible for the colony to eventually cease reliance on food supplies from Britain. He showed skills well learned as a youngster, hard work and ingenuity – and perhaps Cornish ingenuity – could achieve in the face of adversity and strange circumstances. He justified the faith placed in him by Governor Phillip, and had also scotched the belief held by many contemporaries that a smallholder could never maintain himself in the colony. His importance in New South Wales history should not be unduly exaggerated and romanticised. It was a brief but crucial role. 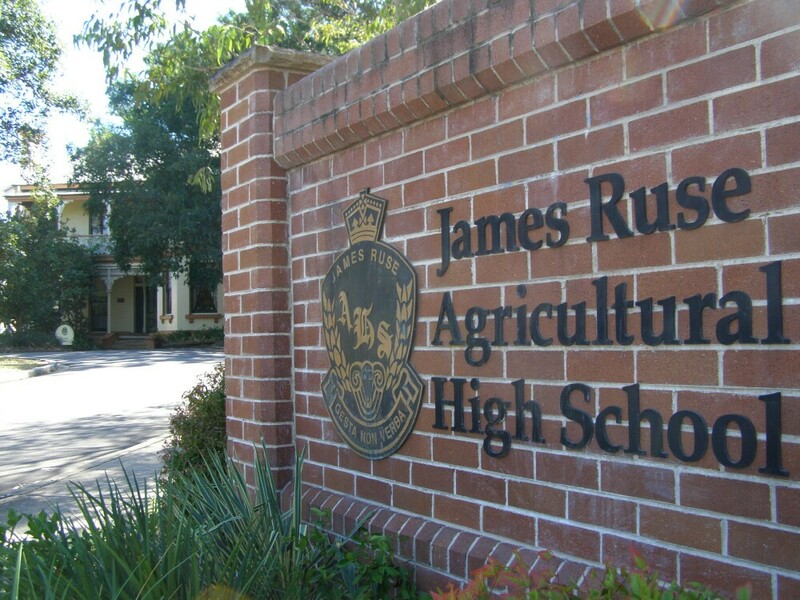 Today the Experiment Farm land is reserved, Ruse’s name is honoured with an Agricultural High School named after him, a suburb named Ruse, and in James Ruse Drive. 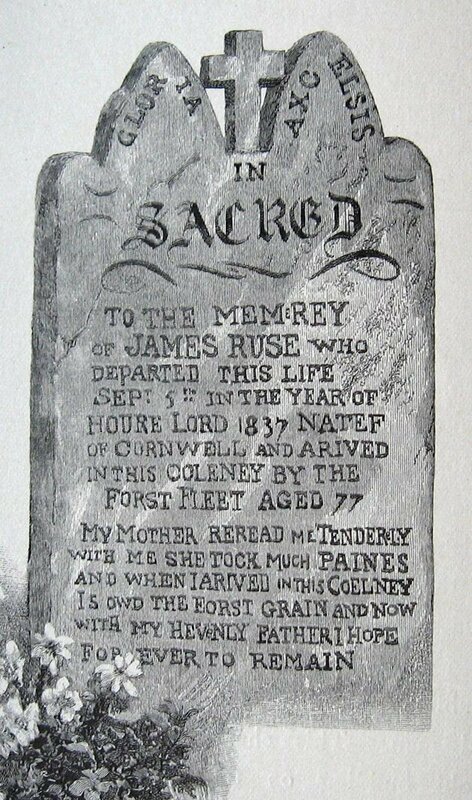 Here’s to James Ruse, an ordinary Cornish with all his failings, coming to the fore in extraordinary times.